IAM Local 10 retiree Joe Harris will be featured on the Sportsman Channel’s “Brotherhood Outdoors” TV show on February 16, 2014 at 11 am EST. IAM retiree Joe Harris of IAM Local 10 in Richmond, VA, will be featured Sunday, February 16, 2014 at 11am EST on Brotherhood Outdoors, the Union Sportsmen’s Alliance (USA) national outdoors television series. 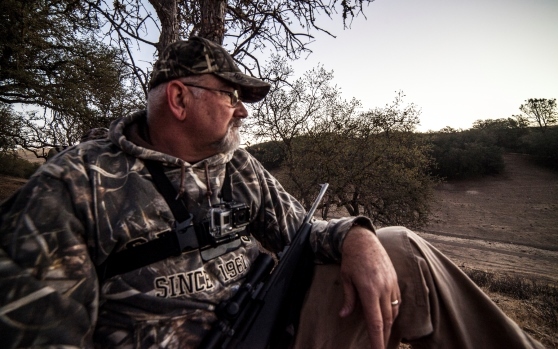 In the episode, Joe, a 40-year IAM member and avid deer hunter, goes on a California hog and wingshooting trip for his first out-of-state hunting experience – and first live encounter with a wild hog. Joe is a dedicated member of Waterfowl U.S.A., and each spring, volunteers with the National Wild Turkey Federation (NWTF) on youth turkey hunts and the organization’s “Wheelin’ Sportsmen” events, helping people living with disabilities enjoy activities in the outdoors like fishing and hunting. When Brotherhood Outdoors learned about Joe’s dedication to his union and his passion for conservation and helping others, they invited him on this “thrill of a lifetime” hunting experience. Years ago Joe and his family suffered a house fire that destroyed their home. Joe says it was his caring union brothers and sisters who helped ease that rough time for him and his family. IAM Local 10 members raised donations to assist in the family’s rebuilding efforts. Visit the Sportsman Channel website at www.thesportsmanchannel.com to check your local listings and catch Joe on his February 16 trip. To learn more about USA and to apply for a chance to star on Brotherhood Outdoors, go to www.unionsportsmen.org.